The following is a guest post written by my 11 year old daughter. Since Allana loves nature, hikes and exploring, she is the perfect person to review the South Seas Island Resort ScoutAbout program. The opinions are from a child’s perspective and her own. When my family and I visited the South Seas Island Resort, I discovered a fun and challenging adventure called the ScoutAbout. 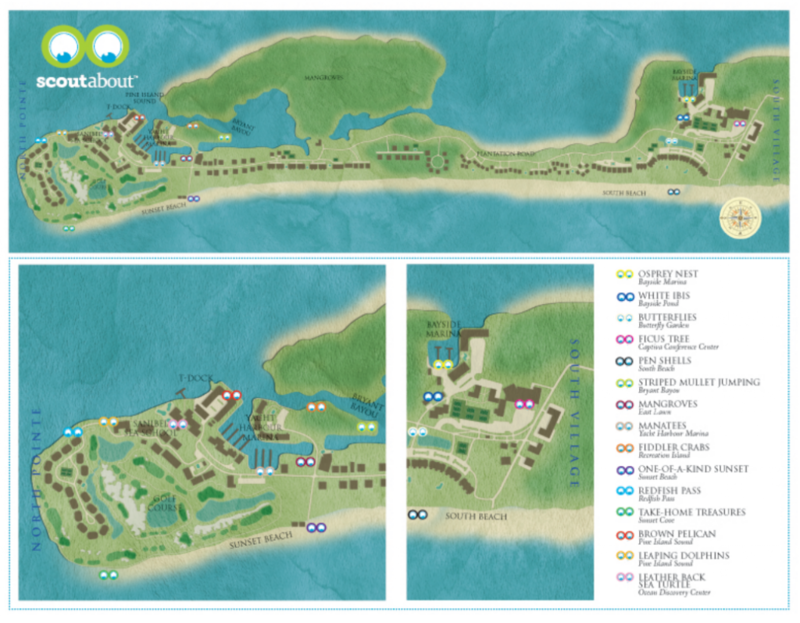 Fifteen ScoutAbout stations are hidden all over the South Seas Island Resort and each station has a different colored bracelet. If you find all fifteen bracelets, you can trade them in for a cool tie-dye bracelet or you can keep all fifteen colorful bands. Sometimes the stations are out in the open and other times, you have to look behind a bush or a building. Each bracelet is a different color and represents something in nature. Stacks of bracelets are stored in each stand that teaches you about a Florida animal or plant. My favorite station was the dolphin station. When we found that bracelet, we spotted a bunch of dolphin tails! We were lucky that our beach villa was really close to some of the ScoutAbout stations. One day I found seven in one day! I knew where to look because the staff members gave us a map to study. It took us three days to find all fifteen ScoutAbout bracelets. We found the last few bracelets on our last day at the South Seas Island Resort. My little sister, Emmalynn, and I earned a spot on the Scout About Wall of Fame outside of Skully’s. The ScoutAbout adventure was so much fun. If you and your family stay at the South Seas Island Resort, you should definitely participate in the ScoutAbout challenge. 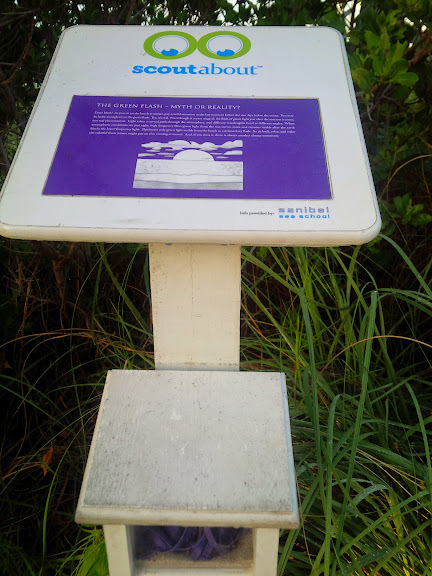 This entry was posted in family life, fun, Life, travel, Wordful Wednesday, Wordless Wednesday and tagged Captiva, children, education, family, family activities, Florida, Life, musings, random, review, Run DMT, science, ScoutAbout, South Seas Island Resort, thoughts, travel. Sounds awesome! Great review Allana! We will definitely have to check that out! This place looks great! We are looking for another getaway in August before school starts. I’ll send this info to my hubby. Great review D! This sounds like so much fun! My gang would totally love it! Maybe we’ll go down for my birthday next month! That’s such a fun idea! And what a great guest post. I’m so envious that you just … see dolphins … right there. Wow! My six-year-old would have a really, really hard time deciding whether to trade in 15 bracelets for a special one. I know he’d want both! THis looks SOOO fabulous!!!! My kids would LOVE it. thanks for sharing your adventure! I know my kids would love it. (and I have to admit, I’d have a blast, too).